I found this website quite by chance nearly 5 years ago and I love it! I’m a tutoring teacher and with the worksheets shared here my students develop confidence and enthusiasm in school, get better grades, have fewer homework struggles and find a new love for learning! It´s an English test for 6th grades (Portuguese Students), with answer key included! It has the following contents: Reading comprehension about School and Extra-curricular Activities,Present Simple vs Present Continuous,Question Tags, Modal Verbs: Can, May, Must. I hope it can help you! It´s an English test for 7th grades (Portuguese Students), with answer key included! It has the following contents: Reading comprehension about School Subjects; Possessive adjectives; Prepositions of time: in, on, at; Question Words; Countries, Nationalities and Languages...I hope it can help you! It´s an English test for 6th grades (Portuguese Students), with answer key included! 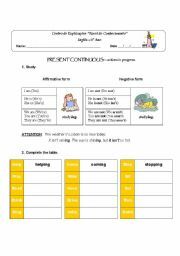 It has the following contents: Reading comprehension, School objects, School subjects, Parts of a school, Timetables, Verb there to be, Prepositions of time, Prepositions of place and Plural of nouns. I hope it can help you! 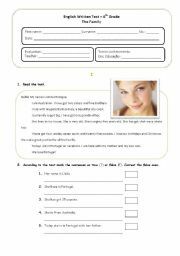 It´s an English test about the Present simple, that I made for my 6th grade students(Portuguese Students). It has an answer key included! It also has other contents like Daily Routine and Telling Time. I hope it can help you! 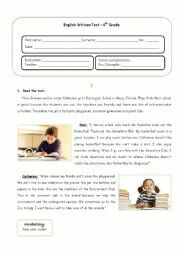 This worksheet helps students to revise countries and nationalities. It´s an English test for 6th grades (Portuguese Students), with answer key included! It has the following contents: Reading comprehension,Family and Possessive Case. I hope it can help you! 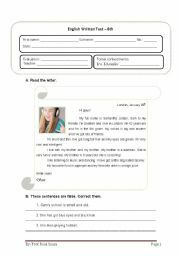 This worksheet helps students review this subject. It´s an English test for 6th grades (Portuguese Students), with answer key included! It has the following contents: Reading comprehension, Personal ID and Telling time. 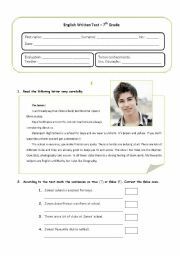 It´s an English test for 5th grades (Portuguese Students). 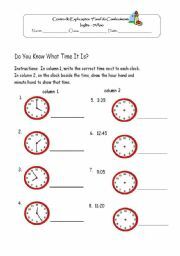 It has the following contents: asking and answering questions, sentences with a or an, cardinal numbers, verb to be, telling time. I hope it can help you!